Lineage. Organized as 840th Aero Squadron on 1 Feb 1918. Demobilized in Mar 1919. Reconstituted and consolidated (1944) with 128th Observation Squadron which was allotted to Georgia National Guard on 30 Ju1 1940. Activated on 1 May 1941. Ordered to active service on 15 Sept 1941. Redesignated: 128th Observation Squadron (Light) on 13 Jan 1942; 128th Observation Squadron on 4 Jul 1942; 21st Antisubmarine Squadron (Medium) on 3 Mar 1943; 21st Antisubmarine Squadron (Heavy) on 20 Apr 1943; 818th Bombardment Squadron (Heavy) on 28 Sept 1943; 840th Bombardment Squadron (Heavy) on 15 Feb 1944; Inactivated on 25 Sept 1945. Redesignated 128th Fighter Squadron, and allotted to Georgia Air National Guard on 24 May 1946. 128th Fighter Squadron extended federal recognition on 20 Aug 1946. 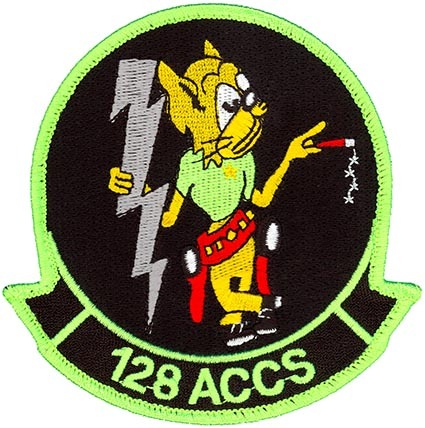 Redesignated: 128th Fighter Interceptor Squadron on 10 Jul 1952; 128th Fighter-Bomber Squadron on 1 Dec 1952; 128th Fighter Interceptor Squadron on 1 Jul 1955; 128th Air Transport Squadron on 1 Apr 1961; 128th Military Airlift Squadron on 1 Jan 1966; 128th Tactical Fighter Squadron on 4 Apr 1973; 128th Fighter Squadron on 15 Mar 1992; 128th Bomb Squadron on 1 Apr 1996; 128th Airborne Command and Control Squadron on 1 Oct 2002-present. Assignments. Unknown 1 Feb-20 Aug 1918; Number 3 Aircraft Depot, Independent Forces, RAF, attached 20 Aug 1918; 2d Air Depot, AEF, 20 Nov 1918-29 Jan 1919; Unknown, 29 Jan-Mar 1919. Georgia NG, 1 May 1941; II Air Support Command, 15 Sept 1941; 71st Observation Group, 1 Oct 1941; Third Air Force, 26 Feb 1942; 77th Observation Group, 12 Mar 1942 (attached to Gulf Task Force, 3 Jul-7 Sept 1942, and AAF Antisubmarine Command, 15 Oct 1942-3 Mar 1943); AAF Antisubmarine Command, 8 Mar 1943; 483d Bombardment Group, 28 Sept 1943-25 Sept 1945. 116th Fighter Group, 9 Sep 1946; 116th Fighter Bomber Wing, 10 Oct 1950; 137th Fighter Bomber Wing, Nov 1950; 116th Fighter Interceptor Group, 10 Jul 1952; 116th Fighter Bomber Group, 1 Dec 1952; 116th Fighter Interceptor Group, 1 Jul 1955; 116th Air Transport Wing, 1 Apr 1961; 116th Military Airlift Group, 1 Jan 1966; 116th Tactical Fighter Wing, 4 Apr 1974; 116th Tactical Fighter Wing, 10 Dec 1974; 116th Fighter Group, 15 Mar 1992; 116th Bomb Wing, 1 Apr 1996; 116th Air Control Wing, 1 Oct 2002-present. Aircraft. In addition to L-4, including O-38, O-46, O-43, A-18, and O-49, 1941-1942; O-47, 1942-1943; B-25, 1943; B-17, 1943-1945. P-47N, 1946-1950; F-84D, 1950-1952, 1952-1955; F-51H, 1952; F-84F, 1955-1960; F-86L, 1960-1961; C-97F, 1961-1965; C-124C, 1965-1973; F-100D/F, 1973-1979; F-105G/F, 1979-1983; F-4D, 1982-1987; F-15A/B, 1986-1996; B-1B, 1996-2002; E-8C, 2002-present. Operations. Repaired and rebuilt aircraft in Zone of Advance, 1918. Antisubmarine patrols, Jun 1942-May 1943; combat in MTO and ETO, 12 Apr 1944-26 Apr 1945; transported redeployed personnel from Pisa, Italy, to Casablanca, French Morocco, May-Sep 1945. Called to active duty as part of the Korean War call-up, 1950-1952. Air defense of Southeastern US, 1955-1961. Flew worldwide airlift missions to Europe, Greenland, the Caribbean, Africa, Australia and Southeast Asia, 1961-1973. Air superiority, air to ground bombing, and suppression of enemy air defenses, 1973-1996. Worldwide tactical bombing, 1996-2002. Through the Joint Surveillance Target Attack Radar System (JSTARS)aircraft, providing an airborne, stand-off range, surveillance and target acquisition radar and command and control centre. Campaigns. Antisubmarine, American Theater; Air Offensive, Europe; Rome-Arno; Normandy; Northern France; Southern France; North Apennines; Rhineland; Central Europe; Po Valley; Air Combat, EAME Theater. First Korean Summer, Fall 1951; second Korean Winter 1951-1952, Korean Summer-Fall 1952. Decorations. Distinguished Unit Citation: Germany; 18 Jul 1944; Germany, 24 Mar 1945. Emblem. Approved 12 Jan 1944.